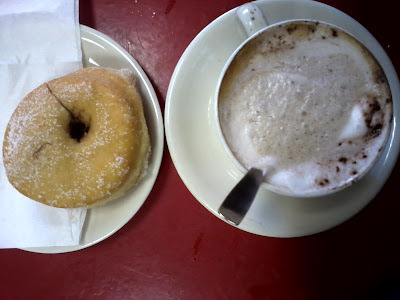 As it is, on weekday mornings after I've taken my daughter to her school I usually drop by for a cup of cappuccino and 'bomba'(a donut without a hole) at Luigi's Bar which is right by the fleamarket. I remember last month I asked if he ever has a 'bomba' with chocolate inside and he said he never had a choco flavor of it. Then came the harsh snowing days when schools and some public transportations were either reduced or suspended,so we basically stayed at home for almost two weeks. Then this week when I returned he asked me right away 'Cappuccino with choco 'bomba'? So I was glad to see that he responds to customer demand even it it's singular. On occasion of the carnival festivities where people especially kids, dress in themed costumes like Spiderman,Snow White etc.,my five-year old daughter doesn't want to be left behind with the customs,although she originally wished to dress like Aurora of Sleeping Beauty or Arielle The Little Mermaid,we were left with no other choice but the white costume of The Snow Princess but we didn't have enough money at hand.So I asked the owner if I could take the item and return the balance I owe which was only €3.Thankfully the owner conceded. Last Friday I also went to the bank to withdraw some money from my husband's account.The good thing is that I don't have to fill-up any form but just by showing my face the clerks know that I'm there in behalf of my husband who they personally know. I just have to say how much I need and sign the receipt and on my way I go. These are only some of the tidbits that happened to me during the recent days.I thank GOD for HIS grace. Ji is this Donut with filling inside? Because here I see a donut that don't have a whole but it has fillings inside. :-) If that donut don’t have a hole that’s pretty wild and look delish! @ Sam D.Maybe I should say though-not to point out my lack of understanding of what a donut should be or look like lol.